“Geology is the study of pressure and time. That’s all it takes really… pressure… and time…,” bellows Morgan Freeman’s character, Red, when foreshadowing his friend Andy Dufresne’s harrowing escape from prison in the critically acclaimed movie Shawshank Redemption. Oddly enough, this same logic can be applied to antibiotic resistance, although bacterial change occurs exponentially more rapidly than the millennia it can take to create various geological wonders. For microbes, however, the biological pressures that scientists presume underlie the formation of resistance mutations doesn’t come in the form of sedimentation, stalactites, or shifts in plate tectonics, as it does in geology. Rather, the genetic burdens exerted by numerous human developed antibiotic, and drug therapies, as well as natural environmental conditions, are the most significant factors fueling resistance. bacterium can double itself approximately every 20 minutes), and ability to survive an extensive number of genetic mutations, bacteria have evolved to be the ultimate survivor. Certainly, long after humans have outlived their time on this planet, microbes will continue to chug along, barely even recognizing our species’ existence. Force the microscopic critters to choose between dying or rapidly adapting by placing them under the chemical squeeze of antibiotic compounds, and they will be all too happy to mutate and return even more virulent. Keep in mind that there are bacterial species (Deinococcus radiodurans) that can withstand a dose of ionizing radiation 3,000 times greater than the dose that would kill a human—due to their extreme ability to repair and adapt to DNA damage that would destroy most life. So how does science keep on top of a such a seemingly formidable, if not tiny, adversary? Obviously, there are multiple approaches, but developing better therapeutics is paramount for most researchers. While compounds that are fast acting, exquisitely lethal, and unique to only pathogenic bacteria would be ideal, science isn’t quite capable of that form of therapy just yet. However, we are well entrenched in the genomic age, and investigators have advanced tools at their disposal which allow them to identify genotypic mutations that rapidly lead to resistance phenotypes. The influence of genomics on fields like microbial genetics is best viewed through the lens of advanced techniques such as next-generation sequencing (NGS), which has quickly evolved into an affordable method now employed in both research and clinical settings. 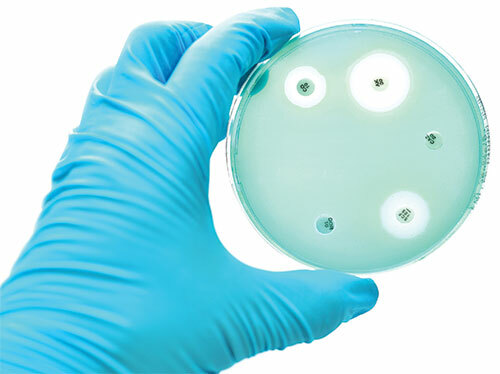 For microbiologists tasked with monitoring mutations within microbial populations that could lead to resistance, being able to quickly and accurately assess bacterial genotypes is paramount in attemping to stay ahead of drug resistance outbreaks.